Reading’s food scene has come on in leaps and bounds in the time since I started writing Edible Reading, nearly three years ago. The Tasting House, The Grumpy Goat, Pop-Up Reading, Tamp Culture, I Love Paella, Caversham Jam Lady, Roast Dinners Around Reading, C.U.P., Bakery House… hard to believe, perhaps, but back in 2013 Reading was a very different place. It makes me wonder what Reading might be like in 2019, whether people on the Reading Forum will be saying things like “do you remember Nando’s? Those were the days” and “what did that place on Gun Street used to be called? You know, the one that does Korean barbecue-ceviche fusion cuisine and has all those giant 3-D chess sets on the mezzanine floor”. One thing Reading has always had, though, is iconic dishes. Whether it’s the suckling pig at Pepe Sale (which needs to be eaten to be believed, only on a Friday and Saturday night and only if you order it before they run out) or Kyrenia’s kleftiko, cooked into strands of surrender, whether it’s London Street Brasserie’s fish and chips, the Top Toastie at Shed or Beijing Noodle House’s glorious duck fried noodles there are some items on Reading’s menus that have attained almost mythical status. This week, I went in search of one I had missed. It all started with a Tweet from regular reader Steven Burns (hi Steven!) a few weeks ago about Standard Tandoori. When I go there, he said, I have to make sure I order the “Standard Super Dry Fry”. Accept no imitations, he told me. But there was more. 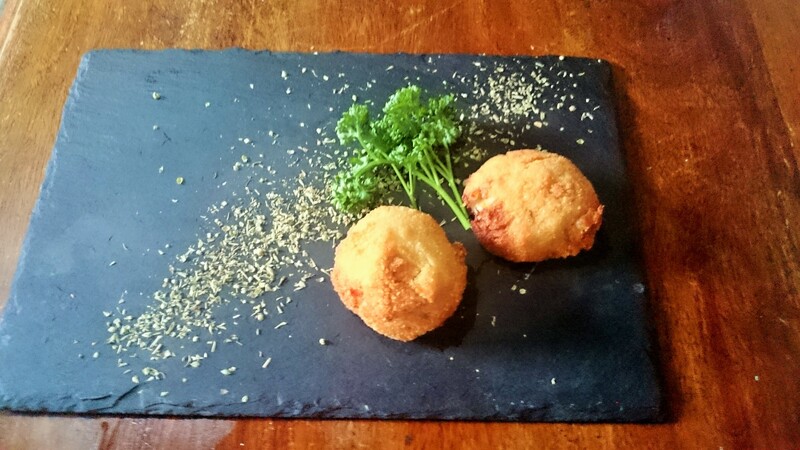 “It’s quite possibly my favourite thing in the entire Reading food scene. I try to save it for special occasions lest I tire.” That, ladies and gentleman, is an accolade I simply had to investigate. If he was right this could be another culinary Holy Grail to stick in Reading’s already overstocked trophy cabinet, and that was a prospect I simply couldn’t resist. Standard Tandoori is on the edge of what is colloquially known as “Welshtown”, the warren of streets off the Caversham Road with names like Newport Road, Cardiff Road, Swansea Road, Barry Place. I noticed on my walk there that born again Mexican joint Maracas had closed, and made a mental note to cross it off my list (a lot of people think that’s a difficult spot, but Papa Gee and Standard Tandoori itself are in the same area and have been doing nicely for years, thank you very much). I also spotted a very tasteful Ercol chair in the window of Epoch3 and wished I had space for it in the spare room, but that’s another story. Standard Tandoori is a bit unlovely on the inside. Standard also describes the tables, and is probably too high praise for the rather tired-looking conference-centre chairs in shabby red velvet. The big room is broken into sections by curious partition walls with a big porthole in the middle and a surprisingly tasteful lightshade filling some of that circular space. The partition walls are covered in wallpaper which is best described as “disco pebbledash”. It’s all a bit odd and I wasn’t sure whether I liked it or not, the restaurant interiors equivalent of modern art. I hadn’t been for a while and the menu looked more tasteful and well set out than I remembered, in a font and format which pays a knowing nod to House Of Flavours, a place which has rather raised the bar for this sort of thing. I didn’t realise beforehand that Standard Tandoori is ostensibly a Nepalese restaurant, although I didn’t take full advantage of this. After all, I was hunting big game here: the Standard Super Dry Fry. The rest might well have turned out to be also-rans. I don’t normally mention the poppadoms at Indian restaurants (and I don’t always order them), but these were noteworthy for what was there and what was missing. No mango chutney – which thoroughly discombobulated me – and in place of my beloved lime pickle something really interesting which looked similar but had pieces of what I think was pickled carrot. Sweeter and lacking that acrid sharpness of a really good lime pickle, but a lovely thing to start with. Eating at an Indian restaurant, in my experience, always involves a tactical decision about what food to leave. I finished the poppadoms gladly, even though I knew I was just postponing that decision to the end of the meal. Starters, which arrived not long after, were a frustrating bunch. Macha pakora was soft white fish in thick, spiced breadcrumbs served with a little dish of tamarind sauce: not offensive by any means, and all done pretty well, but somehow unexciting. The breadcrumbs had a nice flavour and the colour and thick texture I associate with the recently endangered Findus Crispy Pancake. The fish was delicate, and the tamarind sauce was sweet, but somehow it still felt more like the stuff of Iceland than of eating out. Lamb choila on the other hand, from the Nepalese section of the menu, was plain tough. You could see how the dish could have worked – the little hits of chilli, the curry leaves, the pieces of onion and little crispy ribbons of fried onion on top, all things that really could have enhanced some perfectly done lamb. But this wasn’t that: nearly all of it was edible but some was chewy in a way I didn’t enjoy. Much of it resisted the cutlery, and might have even defeated a steak knife. I left one piece in particular, because sawing through it was an effort beyond me. Service was friendly throughout – chatty, friendly, pleasant – but the starter plates were left in front of us for really quite some time. So was that single piece of recalcitrant lamb; I looked at it, wishing I’d left something else to cover it with. It made me wonder how my digestive system would cope with the rest, not at all an enjoyable exercise in mindfulness. We were asked if we were ready for the mains, and by the time our starter plates were collected we pretty much were. Even so there was still a bit of a wait before they came out – not an unwelcome one, as it happened. It gave us time to drink a bit more of the house white, a pleasant and fruity sauvignon blanc which wasn’t overwhelmed by anything we had ordered. I wanted to try a dish to benchmark the Standard Tandoori. 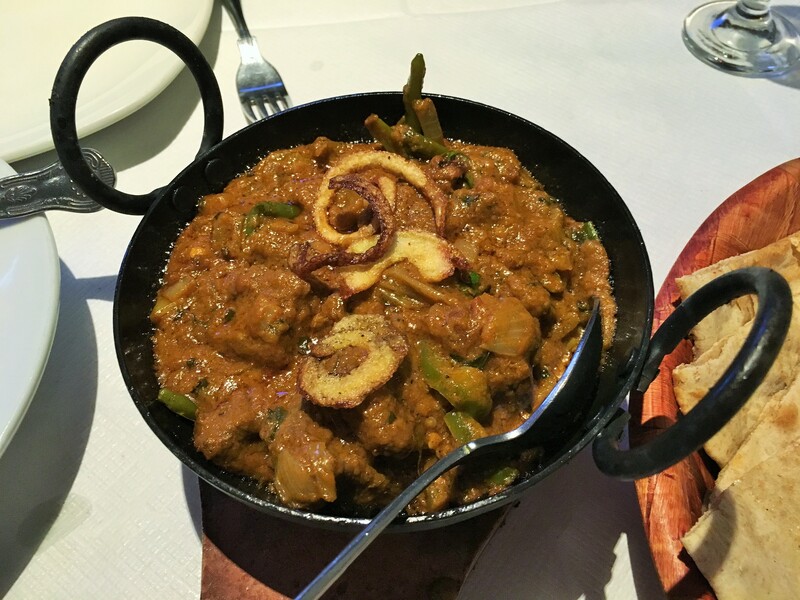 I was tempted by the chicken achari, a sweet and sour number with mango which sounded right up my alley, but in the end I went for karahi lamb, curious to see if it could compete with Bhoj’s glorious, sticky interpretation of that dish. It was clearly some relation, but perhaps a step-sister: the lamb wasn’t as tough as that in the choila but it didn’t fall apart the way I wanted it to. It wasn’t quite as dry and savoury as at Bhoj, so there was plenty of sauce. Lots of chillies in there too, inviting you to eat them or leave them (I hedged my bets – by this point I’d got quite used to doing so). The taste felt less smoky, less complex, more route one. The fried onions on top were – again – a nice touch, although probably also an exercise in diminishing returns by this point. The fact that there was plenty of sauce was handy for the pilau rice and the paratha. The rice was good – only so much you can say, really, but nice to see some cardamom pods strewn in there, booby traps though they are. The paratha was a bit of a poor excuse, I thought. I’m used to beautiful, rich, buttery multi-layered paratha, almost like a savoury croissant, whereas this just felt like two wholemeal pitta breads stuck together like limpets. If the sauce had been better, I’d have been sadder; scooping is a beautiful, magical thing, but it just wasn’t happening that night. Finally, the star of the show: the Standard Super Dry Fry. It was a good example of how appearances can deceive, because when it arrived I did find myself thinking “is that it?” It looked like the kind of Campbell’s Cream Of Tomato Soup based curry I’ve spent my whole life trying to avoid ordering (and failing every single time I set foot in Reading’s now-departed old school Indian restaurants like Khukuri and Gulshan). Well, as it turns out that did it a disservice. It did what it said on the tin: properly dry, the sauce condensed down to be sticky and intense. The chicken was beautifully cooked – again, on the dry side but perfectly so. And I do agree that there’s something about that sauce. It’s almost the perfect curry, I would say: the balance of spice, nowhere near overpowering, was interesting enough to appeal to people who would normally opt for the beigeness of a korma or a pasanda, while the taste was sufficiently complex that chilli demons too might give it a whirl. More fried onions, too, because that seems to be a hard habit to break. I really liked it, and I’m glad I tried it. Was it alone enough to justify a trip to Standard Tandoori? Yes, probably just about. Would I go back specifically to have it again? Probably not. I would have had a pistachio kulfi for dessert if I hadn’t been so full (and the one I saw at a neighbouring table looked quite lovely) but as I implied earlier, all meals in an Indian restaurant – like all political careers – end in defeat. I waved the white flag with some rice, some karahi sauce and one limp quadrant of paratha in front of me. It probably tells you something that every single morsel of the Standard Super Dry Fry was gone. I found room for the Elizabeth Shaw style mint that came with the bill, though, because if you can’t eat that something has gone badly wrong. The whole thing, with those two glasses of wine, came to forty-two pounds not including tip. I felt full, I felt a little bit underwhelmed, but I certainly didn’t feel ripped off. Standard Tandoori, like many of Reading’s old stagers (Garden Of Gulab, I’m looking at you here) feels like a restaurant which may well have been amazing once and is now merely good. 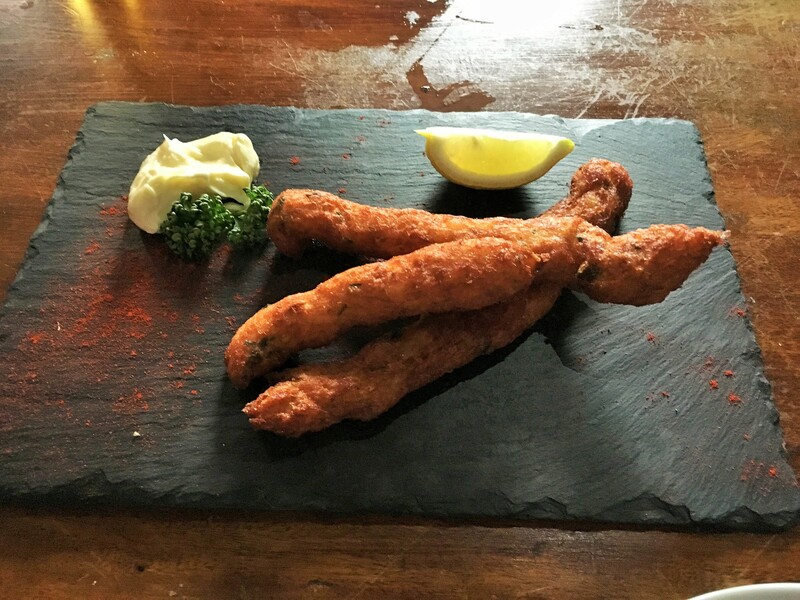 I’m glad I went, and I’m glad I tried the Super Dry Fry, although it won’t be ending up in my metaphorical trophy cabinet of iconic Reading dishes. But perhaps that misses the point, because the map of Reading will look different for each of us. 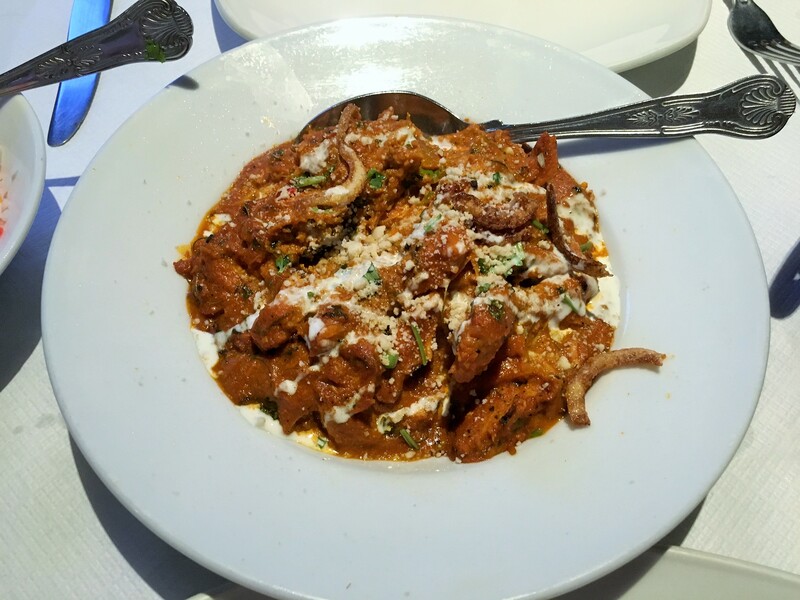 For me it will always be about the karahi lamb at Bhoj, or the jeera chicken starter at Royal Tandoori, a plate of chicken festooned with toasted cumin seeds which gets more delicious every time I have it. Your mileage will undoubtedly vary, and life would be very boring if we all went to the same places all the time (plus, people would have worked out who I am by now). For me at least, the search for the next big thing continues. But then again, there wouldn’t be much of a blog for you to read if it didn’t. I Love Paella moved from The Horn to The Fisherman’s Cottage in November 2016, and left the Fisherman’s Cottage in July 2018. I’ve left this review up for posterity. Well, it wouldn’t be the first time that a rave review from me looked like something of a kiss of death, and so it came to pass that early in the New Year I started getting reports that people tried to go to I Love Paella to find the windows ominously unlit. I myself trekked down the Oxford Road to take a friend there for the first time only to have my worst suspicions confirmed. No sign of life, the shutters down. Soon after, I Love Paella announced that it was leaving Workhouse Coffee with further announcements to follow. I know it’s not all about me, honestly I do, but I couldn’t help thinking The curse of Edible Reading strikes again. Fast forward to March, and it turned out that my fears were unfounded. In a surprising announcement, I Love Paella confirmed that it would be taking up residence in The Horn, the Castle Street pub which had previously never really featured on my to do list of Reading’s nightspots. 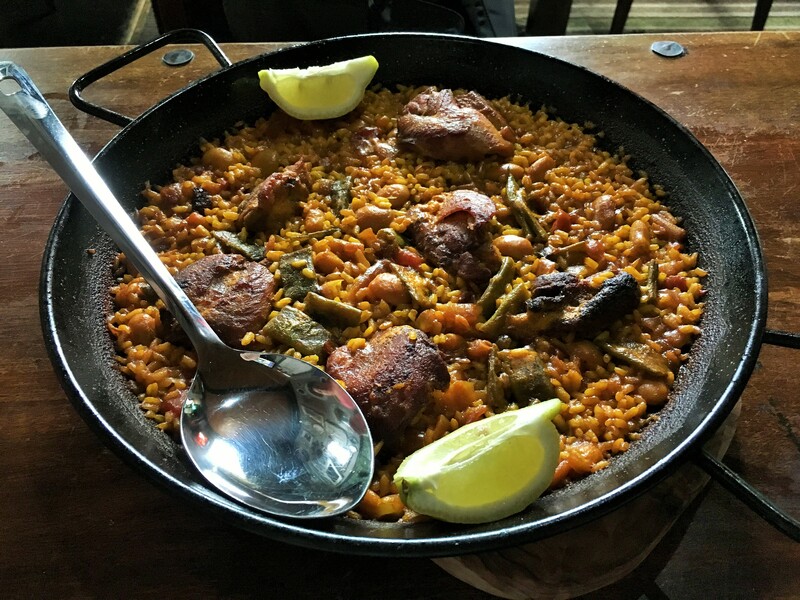 Photos appeared on Twitter of a spick and span new kitchen and huge new paella pans, menus began to appear online and a launch date was announced. I went shortly after it opened but I played it safe, ordering the things I would have ordered in the old premises. I had a lovely meal – although everything came out very slowly – but I knew that it was too soon and that I had to give them time to settle in. So I’ve been watching all the plaudits on Twitter, biding my time and finally, nearly two months on, I made my way there to try the place out properly. I felt a bit nervous, to be honest: would my favourite restaurant be all grown up in its new home, or would it have overextended itself? I’m a restaurant reviewer, not a pub reviewer, so I’ll leave the detailed descriptions of The Horn to others. Friends who have been have always expressed vague suspicion, but all I can say is that I thought it looked like quite a nice boozer. The room on the left is lighter, with tall tables and stools and windows all along one wall. On the right is a more traditional room with a couple of biggish tables, and up a step is a smaller room with a few little tables. I wouldn’t have had a problem eating at any of them, although the table I initially sat at did have that disconcertingly sticky varnish I always fear could remove multiple layers of skin in one go. I’ve been told before that it’s a pub for sports fans, and there were a couple of screens showing a possibly (though how would I know?) crucial match between some overpaid men in red and overpaid men in blue, but on a Wednesday night it was largely empty. The menu is much wider than the one ILP used to offer at Workhouse Coffee and I was determined to order lots of the new dishes to see whether they were truly taking advantage of the improved kitchen facilities. This meant passing up the empanadas, although never without regret, and – particularly disappointing, this – the grilled goat’s cheese with tomato jam from the peerless Caversham Jam Lady (her lemon curd rocks my world, since you asked). 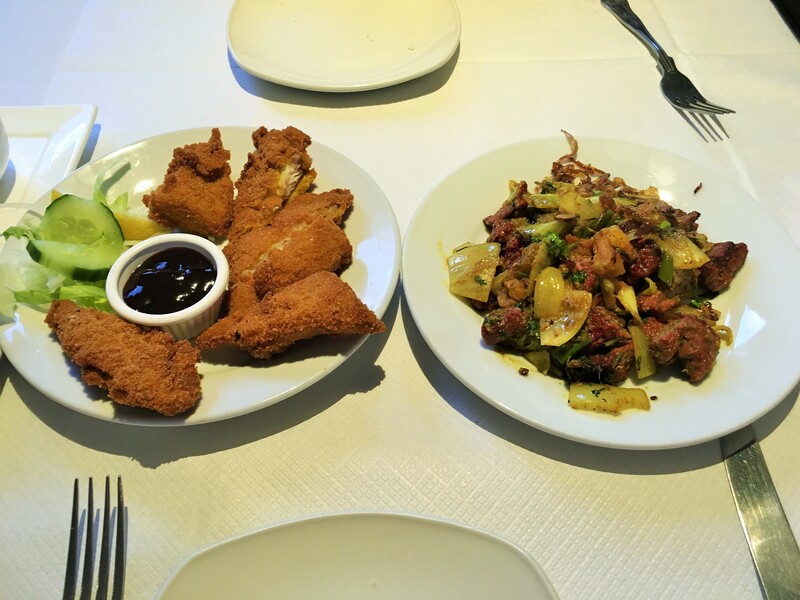 So the starters I chose had a double burden to bear: they had to be good, and they had to be better than my happy memories of meals from 2015. Could they pull it off? In a word, yes. Chicken bravas was the most vanilla of them but still thoroughly successful. Beautiful cubes of fried potato came topped with a piquant bravas sauce and a healthy dollop of pungent aioli, the whole thing pimped with crisp shards of chicken thigh (the menu says there’s rosemary in there, but if there was I didn’t taste it). A lovely, starchy, spicy start to the meal – although if I had one criticism I thought it could have done with a little more bravas sauce. There was still a pitched battle over the last few pieces of chicken, though, and nothing was left. If the chicken bravas was good, the other two starters were great. Croquetas are exactly the sort of thing I always wanted to see ILP doing and these were as good as any I’ve had in Spain or indeed anywhere else in the UK. Beautifully presented – I know people have a bit of a beef with food on slate but it’s never bothered me – these were two gorgeous crunchy shells full of a perfect béchamel with Roquefort (always very popular in Spain for some reason). Some blue cheese dishes never really get started, others beat you over the head with salt, but this managed to steer the perfect course between those two extremes. I wish I’d ordered a whole portion to myself. I’ve had sidra and cabrales in Madrid, experienced that perfect contrast between crisp fresh apple and stinky, agricultural cheese, and I never thought I’d have an equally joyous experience on a street corner in central Reading with a perfect croqueta and a bottle of Bulmers. Life can be full of wonderful, random surprises. Last but not least, an innovative starter that combined two of my very favourite things, and a dish so popular that the bar staff had to check after I ordered it that they weren’t sold out. Salt cod churros sounded so fantastic on paper that I simply had to know what a fusion of those two things would look and taste like. The answer is that they look a bit like churros but taste like the best fish fingers in Christendom. I have a huge soft spot for salt cod and again, there was lots in these – no excessive padding out with pointless potato – but also little green spikes of chive in the mix. There was more of the aioli, but somehow it tasted a little different with the churros. Almost like tartare sauce, although I think that was probably a culinary trick of the light. You order and pay at the bar, and our dishes were brought out one after another in a way that was very well paced. I’m sure it helps that I think we were the only customers eating in the pub that night, so I can’t guarantee how they will manage in the busier times they deserve, but it does mean I get to say lots of nice things about the service which was a pleasure from start to finish. The bar staff were lovely and friendly, they chatted as they brought things out, they took compliments back to the kitchen (pretty much every time we finished a dish, to be honest) and they seemed almost to glow with pride at the food being served up in their pub. Quite right, too. I couldn’t very well go to I Love Paella without sampling the eponymous dish, so a pan of chicken paella was the last thing brought out, resting on a wooden board on the table. It’s quite a daunting prospect, even between two people – a sea of rich, dark, glossy rice with chicken thighs poking up from the surface. It looked terrific, and it tasted even better: the stock had reduced perfectly, coating the ever so slightly nutty plump grains of rice, the whole thing lip-smackingly savoury and salty. 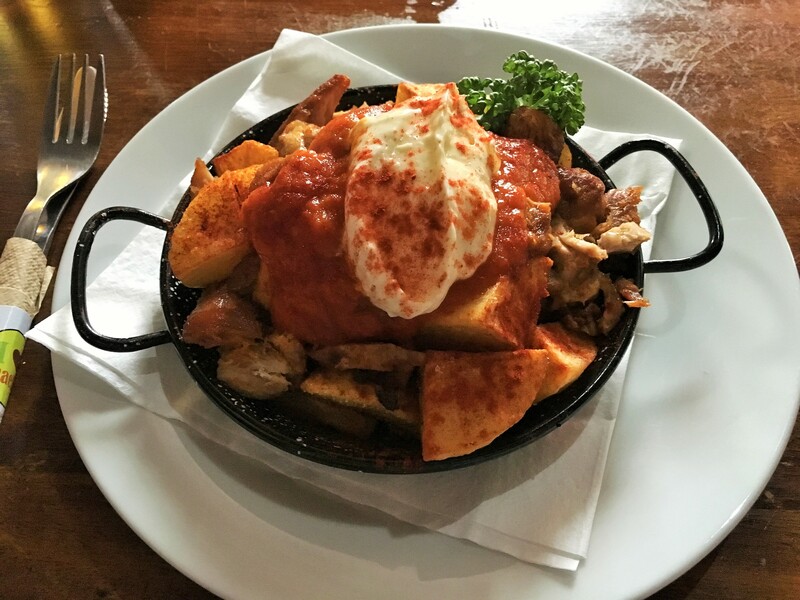 The chicken, as in the bravas, was crisp where it needed to be and tender everywhere else, and broke easily into strands to mix with the rest. But there was more to it than met the eye, because it was also studded with cannellini beans, flat green beans, peppers and onion, making every forkful a fresh epiphany. Towards the end, you could scrape the metal spoon along the base of the paella pan liberating the best bits of all, caramelised, almost crunchy rice. My companion ate less than half. I, being both greedy and in raptures, ate more than half but even so there was a little left. Not quite enough to take with us, although the bar staff went to great pains to remind me that they could package up anything I couldn’t quite eat. Next time I might just go on my own, pig out and still have loads for the next day to make my colleagues green with envy as they make do with our subpar canteen (if that makes me sound like a bad person – and it probably does – all I can say is that you haven’t tried this paella; you can tell me off once you have, if you still want to). I didn’t have dessert: the only options were brownie and cheesecake, and I was too full for either. Normally that wouldn’t bother me in the slightest (they’re pretty basic offerings) but the menu specifically says they are homemade, so if you do have a sweet tooth I wouldn’t rule them out and I imagine they’d be good. Personally, if I’d had more room I’d have been tempted to have some manchego, but that’s possibly just me. The whole thing, including those two very welcome bottles of Bulmers, came to just over forty-two pounds. I was so disappointed when I Love Paella closed, and I remember saying so to them on Twitter. They told me not to worry and said that they had big plans. I should have believed them; that will teach me for doubting. I said I was nervous about reviewing I Love Paella, and that’s true. If it had been disappointing or inconsistent I’d have been writing this review constructively but critically, with a very heavy heart. I’d particularly have been dreading this bit at the end, where I have to tie it all up. So it’s with a mixture of joy and relief that I get to say this: go. Go to the Horn, whenever you can, and eat this food. And if you’re worried about the Horn not being your kind of place, get people to go with you. Let’s make it our kind of place, stage a pitch invasion if you like, because a pub that does food of this quality in this location should be our kind of place (and if it really bothers you, I reckon I Love Paella might be one of the only good reasons to use Deliveroo – if you happen to have the right postcode). Personally I’ll be back at the Horn, pretty soon. In fact, I’ll even sit through Everpool playing London Irish or whoever they are, if that’s what it takes to enjoy dishes like this. I have a funny relationship with Thai food, I think. It would never be my first choice when suggesting a meal out with friends but when I go to one I always like it. “Like” is the operative word here, though: I rarely love it. It would probably take a more discerning palate than mine to distinguish between the fishcakes or the pla chu chi I’ve had at all the Thai restaurants around Reading. So instead it comes down to the price and service, arguably the cherry on the cake rather than the cake itself. 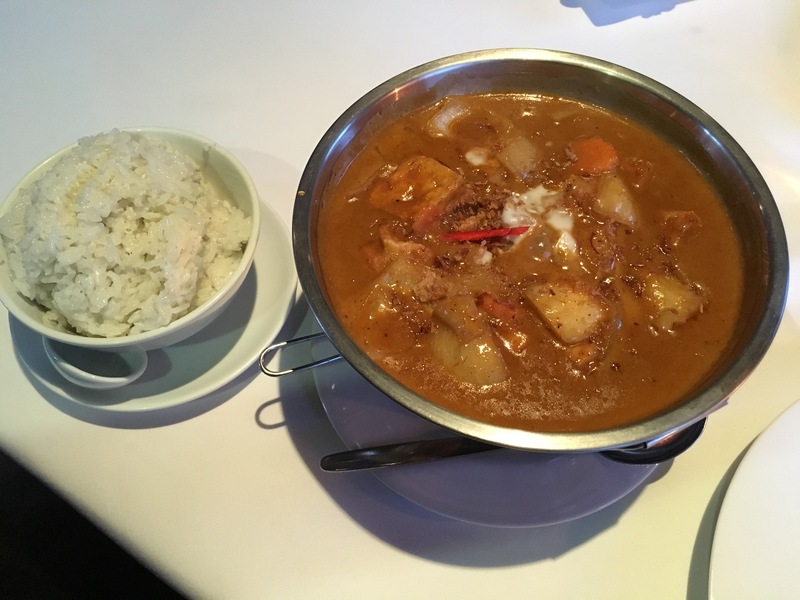 Sometimes a single dish will stand out, but my meals at Thai restaurants have generally been been solid and respectable – neither stellar nor sad, just somewhere comfortably in the middle. This all dawned on me, as it happens, when I sat down at Chaiyaphum and started to go through the menu. The decision to go to an out of town restaurant seems to happen increasingly when I am on a vegetarian week – for those of you new to the blog, my New Year’s resolution last year was to review one vegetarian main course per month – and here I was again, jumping into the car to go and eat tofu (not sarcasm: I was actually looking forward to trying the tofu). Chaiyaphum is up on the A4074 just before the turning for Gallowstree Common, the road towards Oxford which, like hundreds of others across the UK I’m sure, has the nickname “the seven bends of death”. The building itself is an old red brick pub on a crossroads where I can imagine highway robbery used to happen (ironically I once ate at the Pack Horse just down the road, where it was still very much taking place). Inside, though, you’re under no illusions that you’re in a restaurant not a pub. Goodness, but it’s purple. The walls are purple. The ceiling is purple. We’re talking somewhere between Dairy Milk and Quality Street purple. Properly purple. That makes it sound awful, but actually I rather liked it, and the whole thing is decked out with statues of Buddha, art and artefacts, a picture of the Thai king and queen and, incongruously, a whacking great piano in the bar area. We ate in the room off to the right, a split level affair, with a nice view out onto the garden. A few tables were reserved when we got there, which was encouraging as we were literally the first people to arrive. I don’t normally talk about background music in a restaurant, but I’m going to make an exception here just to say that Chaiyaphum had managed to get hold of the most surreal easy listening album of all time. I’d never heard hotel lobby soft jazz cover versions of Womaniser, Moves Like Jagger, Sweet Child O’ Mine and The Only Girl In The World before, and I can safely say that if I never do again it might be too soon. It took me right back to the Nineties, when adverts on late night ITV would proudly offer compilation CDs which were “not available in any shops”, usually with good reason. Anyway, back to the food. The menu was almost identical to every other Thai restaurant menu I’ve read on duty, which made me wonder whether what we get is the anglicised version, watered down just enough to make it seem exotic yet safe. And therein lay the problem for Chaiyaphum, something I was pondering throughout my meal there – because when a restaurant is a little way out of town, especially when you have to drive to get there, being much the same as other local Thai restaurants just isn’t going to be enough. It has to be better, cleverer, more distinctive: otherwise why make the effort? The starters were a mixture of the safe and the unknown. Starting with the safe, the chicken satay was a pretty good example. I think the meat was thigh rather than breast – always a good thing, in my book – but either way it was juicy and well marinated, tender with (I’d guess) some lemon grass. The satay was also good: deep, rich and earthy, although I always wish there was about twice as much sauce. But, and you can see the trend starting to come through loud and clear, it was good but not great. The sesame chicken toasts were just lovely, and eating them made me slightly sad that Thailand has this and we just get fried bread. It’s probably hard to excite anybody writing about these – I mean, you know exactly what they will look like, what they’ll taste like, how they will be, that exquisite balance of crunch and tenderness. And yet they rarely disappoint: these certainly didn’t, covered with sesame, packed with chicken and then fried to the point of decadent filth. I dipped mine in the small pot of chilli sauce (again, wishing there had been a little more) and thoroughly enjoyed it, but I knew I’d hardly taken a risk. The third starter was more of a venture into the unknown, mainly because I find it very hard to turn down soft shell crab when it graces a menu with its presence. It came battered and fried, obscured by a cornucopia of other lovely things – lots of finely chopped garlic, fried onion, spring onion and a fair few slices of red chilli. I liked this dish an awful lot – the crab was delicious, the batter was light and delicate and all the gubbins on top really made every mouthful magnificent. It came with two pools of brown sauce – the menu describes both a pepper sauce and a Thai garlic sauce and I have no idea which this was but it really wasn’t needed and didn’t add an awful lot. At the end, after the crab was demolished (and it didn’t take long) we raced round the plate with our forks making sure not a scrap of the nice bits was left: all that remained were the sauces and the ubiquitous vegetable flower. Main courses continued the trend. 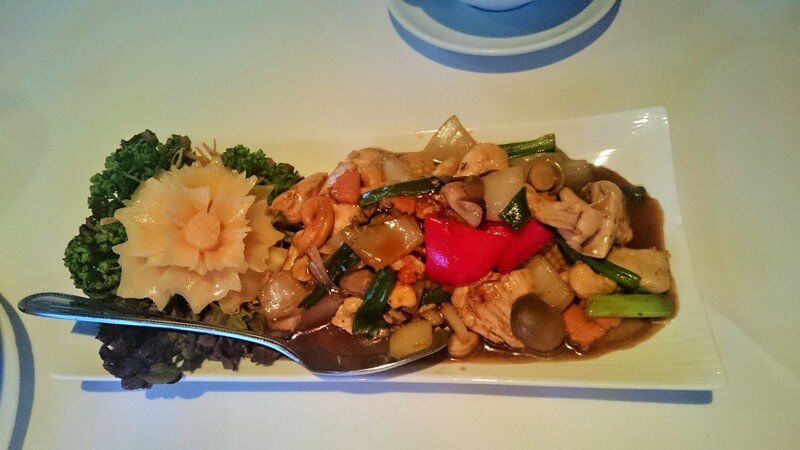 Gai pad himmaparm, recommended by the waitress, was a good example of a Thai chicken stir fry. This one had cashews, a few pieces of halved baby corn and plenty of vegetables – why is there always so much onion? – and was decent if not outstanding. The sauce was rich with chilli and especially garlic (nobody has ever gone wrong by giving me too much garlic) and was tasty but not life-changing. As so often with these things, it came in a flat shallow dish which meant that not only wasn’t there enough sauce but what sauce there was was blessedly difficult to get on to your plate, stirred in with the coconut rice where it belonged. I’d been looking forward to the massamun tofu. Ordering it was, to some extent, playing percentages: I figured that one of my favourite things about eating Thai food was that glorious mixture of slightly sticky coconut rice and a sweet, spicy sauce, so if the tofu didn’t work out I would still get to enjoy most of the dish. The tofu itself wasn’t bad – you got lots of it, big hefty pieces, and they had some texture and contrast to them. That said, there was a slightly sour taste to it which seemed odd against the massamun sauce. The sauce itself also didn’t quite work – all sweet, no savoury, not enough punch or spice. Perhaps, because it was a vegetarian dish, there wasn’t any fish sauce in it to add that contrasting note. The potatoes in it, weird corrugated edges and all, were soft and floury and not quite right. Ditto for the slices of carrot, again tinned-vegetable soft. There were a few crisped fried onions on top, but not enough. By the time I got to the rice and sauce stage, ostensibly the highlight, my heart just wasn’t in it. We both had coconut rice – the waitress asked if we wanted one between two and we decided against it, but we should have listened to her as one would have been quite enough. It was – bit of a theme here, isn’t there – pleasant: edible but not incredible. We’d over ordered on the starters (wilfully if I’m honest, in case the whole tofu thing didn’t work out) so there was no chance of having dessert. We both had a glass of house sauvignon blanc – nice, fresh and easy to drink, if perhaps not quite as cold as I’d have liked – to start, and my companion also had a bottle of Tiger, after being told at extensive length about all the beers that were currently out of stock. I had a diet coke and didn’t hugely feel like I’d missed out. Service was lovely. There seemed to be two waiting staff on and they were looking after quite a lot of tables, but regardless of how busy they were they were friendly, polite and happy to make recommendations. Beautiful uniforms, too – maybe a funny thing to notice, but there you are. The food took just about the right amount of time to come out, and all the other tables looked happy. I saw families with small children, a couple of chaps enjoying dinner together and, just across from me, a birthday celebration (with the exchange of bags from Fortnum & Mason – fancy!). They all looked like they were having a brilliant time, and I wondered why I wasn’t quite so enamoured. The total bill, including a ten per cent service charge, was sixty-three pounds. Interestingly that service had been pre-added – perhaps the south Oxfordshire red trouser brigade (there was a very eye-catching example right next to my table, a veritable rhapsody in scarlet: I could barely stop gawping at him) aren’t so keen on tipping the staff. Anyway, it all seemed fair enough to me and the service was one of the high points so I wasn’t bothered, though I can imagine it would rankle with some diners. As we drove away we were discussing whether Chaiyaphum was good enough to merit a drive out of town. As you can probably tell by now, my answer is not really. It’s by no means a bad restaurant: the food was decent, the service was charming, the room managed to be bling and tasteful at the same time, purple paint and all (I did find I left really wanting an individually wrapped hazelnut in caramel: the power of subliminal advertising). But ultimately, there is no USP for Chaiyaphum unless you live round the corner. 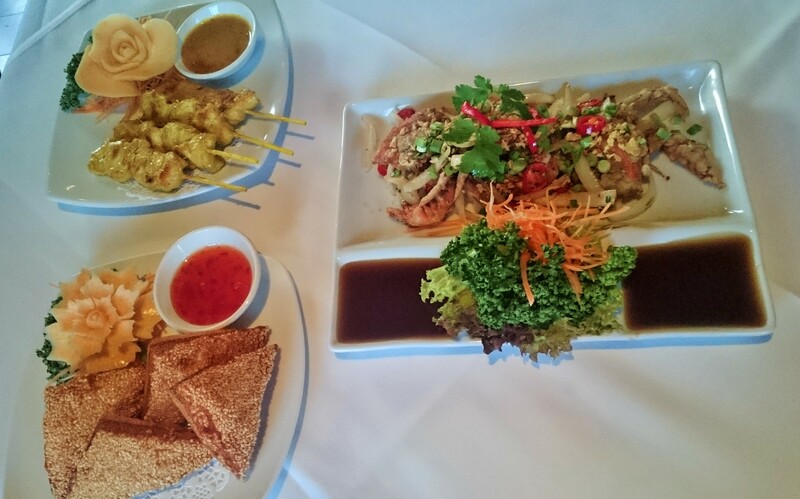 It’s stylish, but so is Thai Table. The service is friendly, but it’s just as good at Thai Corner. The food is quite nice, but Thai food seems to be quite nice everywhere, and never better than that. Ultimately, it’s just not enough to get me to leave Reading and head for the Chilterns. Maybe this restaurant is for the red trouser brigade and they see it the other way round: because they can go to Chaiyaphum there’s nothing to make them go into town. Each to their own, and thanks but no thanks. Maybe next time I’ll go to Oli’s Thai in Oxford, which I’m told blows them all out of the water. 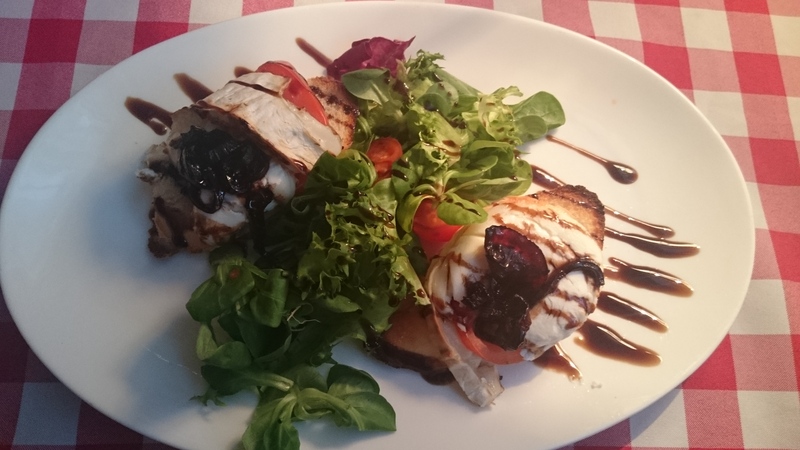 When people suggested I review Buon Appetito, an Italian restaurant down Chatham Street, right next to the Central Swimming Pool, I looked at the menu online and nearly rejected it out of hand. Nothing about it suggested authenticity; I’ve never been to Italy, but from the looks of the menu nor had anyone associated with Buon Appetito. It was a few mainstream pasta choices, some not wildly exciting pizzas and a few other bits and bobs. I wasn’t even sure whoever had put this menu together had even been to Bella Italia, for that matter. Then I looked at the TripAdvisor reviews and wondered what I was missing. Almost without exception they were raves: not all obvious shills by people who had only ever written one review for TA, but reviews by real people who, it seemed, had something to compare it to. Other Italians need to up their game said one, among the top three pizzas I’ve ever eaten, and that includes in Rome said another. Well now! So what we had here was the restaurant equivalent of an irresistible force meeting an immovable body: which was right, my opinion based on the menu or all those TripAdvisor reviewers? I simply had to know. The first challenge was getting anyone to show us to a table. We went through the door on a gloomy weekday night and found ourselves standing there for a good five minutes before a waiter turned up. The last time I’d eaten at this site was back when it was the sadly-departed Chi and they’ve done a good job with it. It feels bigger, lighter and airier, and nobody goes wrong with the classic combination of red gingham tablecloths and plain wooden chairs. The room through the back, where we were seated, is a pleasing square space and the art taking up the whole of the far wall, an Italian scene of an old cobbled street, opens it up nicely. We were the only people there, although a table in the corner was booked for two and had a vase sitting on it with a dozen red roses. Aw! I thought to myself, trying to overlook the rather invasive background music. It sounded like it was being played on a chewed cassette tape. I still didn’t much fancy the menu but we took recommendations from the waiter, a young, chirpy, pleasant chap who was happy to talk us through what was good. All the pizzas were excellent, he said, and so was the grilled goat’s cheese starter, the bruschetta and the tagliatelle. That made the choice a lot easier, so we ordered half a bottle of red wine and waited to see what was in store. This led to the first oddness of the evening – I was expecting a half bottle, 375ml, of a named wine with a label on it. Instead we got a plain unlabelled full size bottle, wearing a red napkin like a little neckerchief, half-full of some unnamed liquid. All a bit weird, although it tasted nice enough (if a little tannic). The music got a little more frantic – all Italian, with more noodling and guitar shredding than I associate with Italian music. Personally I’d have preferred Boys Boys Boys by Sabrina, but you can’t have everything. We shared the two recommended starters. The grilled goat’s cheese was adequate but probably no better than that. The cheese itself was nice and earthy, and it came with some caramelised red onion (I couldn’t shift the suspicion that this was out of a jar) and some balsamic glaze on two slices of baguette. Pretty tasty, although more about assembly than actual cooking. Much the same was true of the bruschetta. 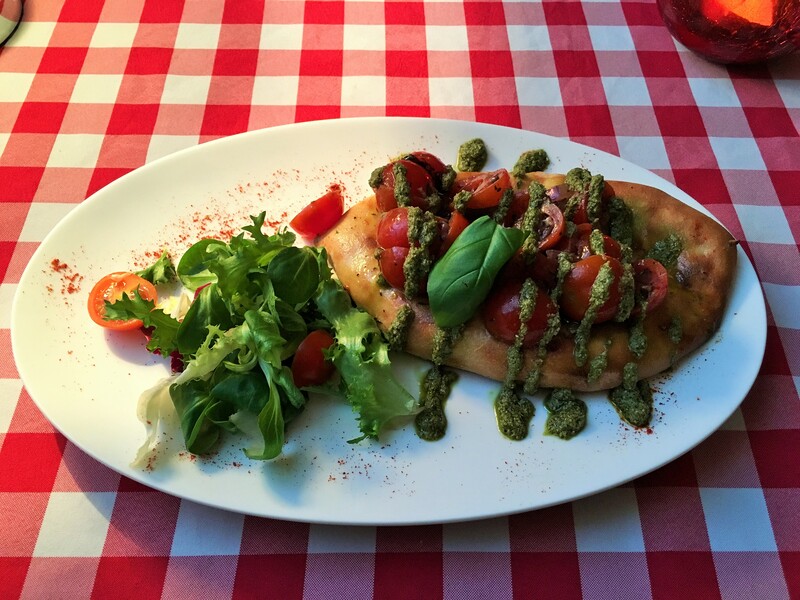 It was a small oval of pizza bread (cooked in the pizza oven, the waiter had proudly told us) topped with halved cherry tomatoes, some red onion and drizzled with pesto. The pesto had the thick texture and taste that again suggested it had come out of a jar, or maybe a tub. The tomatoes were sweet and not unpleasant. The pizza bread was not the right choice for this, because there was nothing for the juices from the tomato to seep into, although that’s probably fair enough because nothing had been done to the tomatoes, so there were no juices anyway. The waiter asked if we’d liked the starters as he took them away, and we said they were nice. Ten per cent fibbing, I’d say. By this time the happy couple had turned up and were sitting at their assigned table, which was slightly higher up than ours, as if on a dais. They ordered champagne and chatted away to each other in a language I couldn’t make out, and took photos of each other and got the waiter to take pictures of them both. It was quite heartwarming to see, although already I was starting to wonder if they shouldn’t have picked a slightly better restaurant. It was around the time my pizza arrived that I began to wonder whether Buon Appetito was the most misleadingly-named Reading establishment since Great Expectations. I have literally nothing positive to say about it. I have a friend who sometimes complains about pizzas saying they have too much cheese on them, and in the past I’ve always responded to her saying “don’t be ridiculous, how can a pizza have too much cheese on it?” Well it turns out that it can, because my salami pizza was practically nothing but cheese. Covered completely in cheese, a big molten sheet of the stuff, with no bubble or crisp or texture. The base might once have been half decent (though I wouldn’t bet on it) but with so much grease it was sodden and grotty. The salami and pepperoni felt cheap and nasty. The menu claimed there was a tomato sauce hiding under there, but some exploratory work scraping off the gloopy layer of cheap mozzarella revealed nothing of the kind. You know when you get a pizza and you wind up leaving the crust so you can eat the good stuff in the middle? This was a grotesque parody of that, in that I found myself eating along the perimeter because it was the only bit with any crunch or contrast, the only bit that felt like it might have been pizza at all. I have a friend who makes the most amazing pizzas. He makes his own sourdough base, he has a pizza steel, he makes his own tomato sauce, he buys in ‘nduja and friarelli, the whole shebang. Even his vegan pizzas, covered in capers, are remarkable. 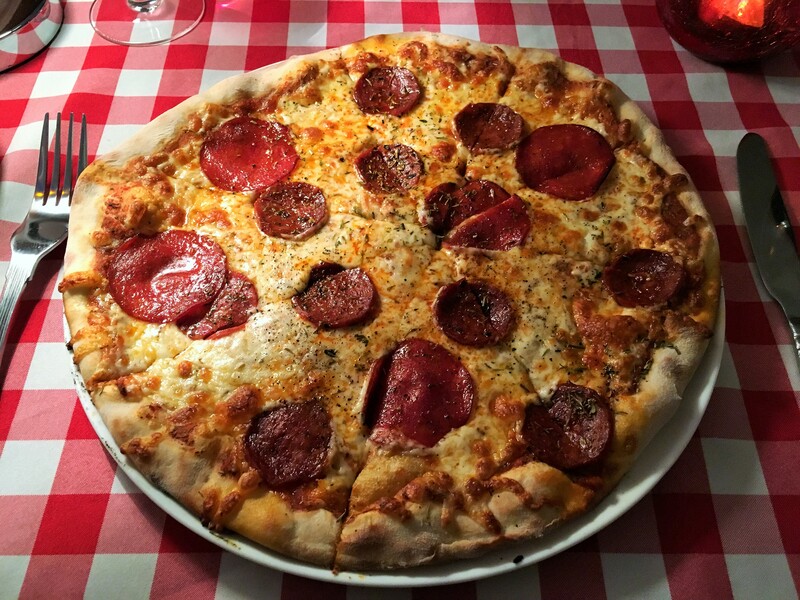 His pizzas – and apologies for being indelicate – piss all over Buon Appetito’s. But to put this into perspective, this pizza wasn’t just not as good as that. It wasn’t as good as Papa Gee’s. It wasn’t as good as Pizza Express’, or Zero Degrees’. It wasn’t as good as Prezzo’s or Strada’s. It wasn’t as good as Marks and Spencer’s, and I wouldn’t have put money on it being as good as Iceland’s. It was a waste of calories, and I didn’t even come close to finishing it. 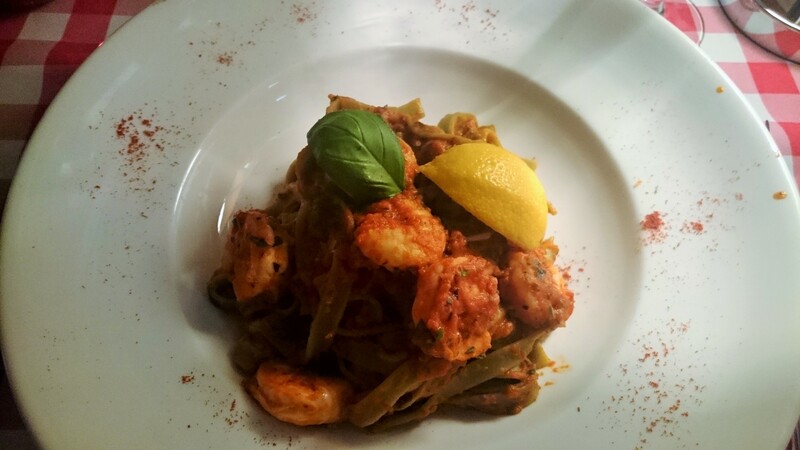 The other main, spinach pasta with prawns, was also disappointing. The pasta was overcooked, squidgy and claggy (not for the first time, I wondered if the chef was Italian: al dente it wasn’t) and the sauce just tasted of tomato with none of the olive oil, garlic and lemon juice it allegedly contained. It needed something (anything!) to lift it, and without that it just tasted like student cooking. Put it this way, if I’d made it at home I still would have been disappointed. A shame really, because the prawns were rather nice. I picked them off by sniping with my fork, and I left an awful lot of the rest. We told the waiter we were really full as he took the main courses away, and that they had been nice. I’m pretty sure by this stage we were eighty per cent fibbing. We didn’t ask to look at the dessert menu and dinner for two came to thirty-seven pounds, not including tip. Our waiter seemed like a lovely chap but it was amazing how often he wasn’t around given that he only had four customers to look after. Getting the bill and paying it were both more difficult than they ought to be, and empty (or half-full) plates were sitting around in front of us for longer than they should have been. I’m baffled by Buon Appetito’s high ratings on TripAdvisor. I wouldn’t want to suggest foul play, but I do wonder how many of these reviewers are regulars or have connections to the restaurant. Who knows? Perhaps they had an off night, perhaps I went with insurmountable preconceptions, but I don’t think so. I think I ate food which had little to do with Italy prepared by a kitchen that probably hadn’t been there. I think there were some jars involved, and some disappointing ingredients. I think Reading has many better Italian restaurants and, most damningly of all, I think that includes a number of chains; when you can eat something better on the Oracle, you really have a problem. As we got up to leave I looked again at the lovebirds, only to find them both tapping away on their phones. I fear they had about as enjoyable an evening as I did.